Fragrance profiler Marion Bendeth shares that fragrance is very much like fashion and that there are different fragrances for different occasions. There is something for every mood. Bendeth continues by saying that one of the most important factors to consider is how the scent makes you feel. Consider for example, where does it take you? It can be fantasy-or reality-based. Perhaps it reminds you of a trip you took or it helps you escape. Fragrance can be a mood elevator, often described by fragrance enthusiasts as ‘a comfort blanket’, ‘permanent supply of hope’, ‘defence shield’ and ‘suit of armour’. Join Perfume Power to create the perfect fragrance for your desired mood by embarking on a scent journey experiencing an exquisite library of ingredients from florals, fruits, woods, greens, aquatics, and spices. During this 3-hour workshop fragrance specialist, Diana Rankin will explore a mood mapping process in scent creation, revealing that scent is the quickest way to get from one state of mind to another. She will further captivate you with a historical journey of fragrance while exploring the deeper significance of perfume in everyday life. Diana will also touch on the power of the sense of smell, the essence of perfume personality and give us a glimpse into the latest research on the mood benefits and enhancements evoked by scent. With the foundational techniques of blending fragrance notes, she will then guide you in creating your very own mood inspired perfume. Who can attend the workshop? 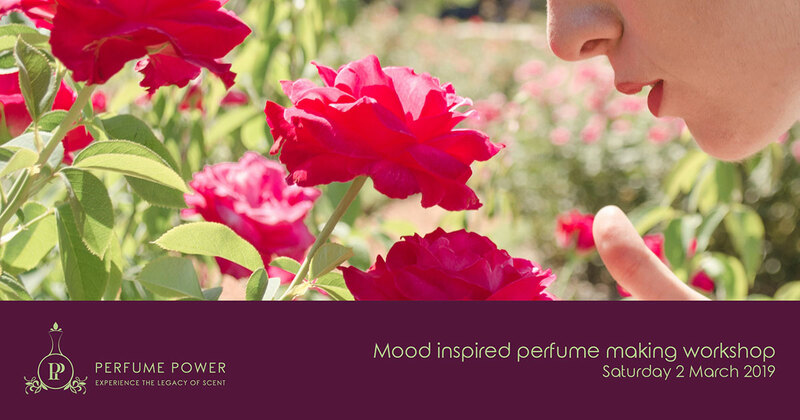 Our mood inspired perfume making workshop is suitable for fragrance lovers and novices. This workshop offers introductory knowledge on perfume creation. After which the advanced workshop can be attended to build on this foundational workshop. It is a great activity for moms and daughters, friends and partners. It also offers as a wonderful gift of appreciation and entertainment for a loved one or work colleague! Quality imported fine fragrance oils, a professional perfume making kit, and notes, an elegant 15 ml take-home perfume bottle and gift bag. Refreshments and delicious snacks. Please avoid wearing any perfume or scented body products when attending this workshop.